Wow, I'm accused of messing with you guys, I finally feel like I'm part of the club, woo hoo! Okay, the "young and good looking" quote actually came from a conversation I had with my sister, she said that's what he said that the lady who was talking to them said about them. I just talked to him again, I asked if he was sure it was the hippie dudes, he said he saw them mostly from behind, he was really busy at the time, but he's pretty sure it was them. He is going to ask the lady that talked to them tomorrow about them if he remembers. I will let you guys know what he says asap. Sorry for the confusion, I actually thought he was referring to the frat boys all along. For the first time in the race, teams were given an option to yield, and the Garners were the only team who opted to stop another team immediately. Thinking that they were neck-and-neck with the "pinks" team, the Garners "yielded" Dani and Michelle, forcing them to wait for an hour - and ultimately get the ax. However, with Ray and Yolanda behind, the Garners could have saved the "Yield" for later. 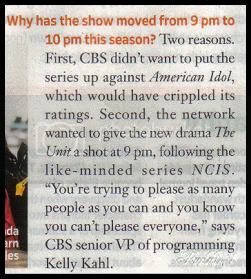 Certainly the Garners won't get much love after Wednesday's episode, but at least one team likes them. According to Lake's mom, Diane, B.J. and Tyler came through Hattiesburg last week and visited with the Garners, including a ride down to New Orleans. BJ & Tyler like everyone , thanks Sups ! I love these guys. If I would have know they were in NOLA I would have run down to see them and given them a big hug. This could be a fake spoiler but I don't think the original is. If it were completely made up was Alaska a coincidence? One thing is for sure, Jeremy's shoes would catch your attention. Who knows why giantsfan is changing the story -- misdirection? Okay, I have lurked on this board for a few years and this is my first attempt at a spoiler. My brother in law works for Alaska Airlines in Anchorage, and about half an hour ago he saw 2 guys go running through the airport with a camera guy and a sound guy following them. The only description I could get out of him was that they were 2 dudes dressed alike in matching gray sweaters and blue Adidas shoes, mid 20's, and they were looking for Northwest Airlines. They spoke to a native Alaska woman in her 50's who also works there and said they were headed to Denver. They went first to Northwest counter, then Continental, then back to Alaska Airlines. 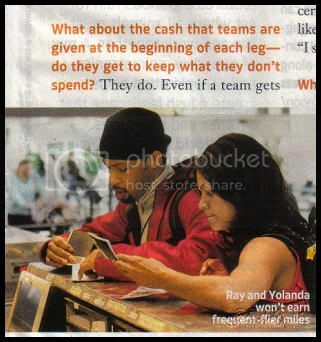 Last night I noticed that Ray and Yolanda were dresses in gray shirts ... Could someone mistake Yolanda for a man and not mention that the people were African-American? I guess the yield is now more detrimental. And looking at the caps at TR files i feel Eric and Jeremy and MOJO did the same thing as Dani during the roadblock and [at least we didnt see] them having to fix it. Puddin, thanks for posting that article. That is great that the teams get to keep the money they get on each leg. Good souvenir to have. 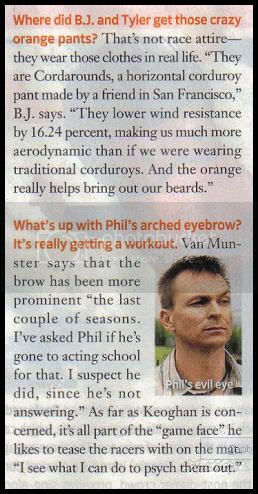 I don't why BJ and Tyler need to be more aerodynmic with those orange cordarounds on. They don't plan to fly do they?? Or does it make them get to the mat faster in a foot race? ETA , on second thought it was probably just a fluke because of the schedule change . The first clip was an interview with the Nerds, the eliminated team who'd not yet been eliminated! Fair warning -- avoid VCAST the day or two before an episode if you don't want to be spoiled. I can confirm that AR have been sited in Perth Western Australia in November, a friend works at the airport. There were about 4 teams noticed by staff. One of those teams has been given a fine because they had concealed food on them, they were trying to take chicken sandwiches off the airoplane. Another team ( that had no money) was reprimanded for pushing to the front of the lines in customs. 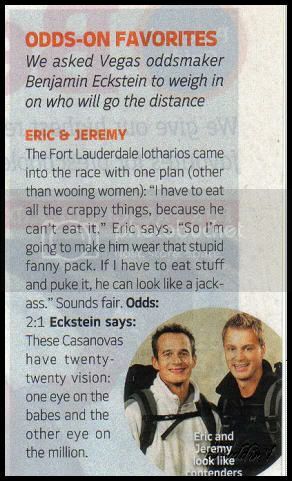 Arguments for Eric and Jeremy: Dressed in ordinary clothes. More likely to be described in their mid20’s than BJ and Tyler. Arguments against BJ and Tyler: No reference to beards. Unlikely to wear ordinary clothes. The description “young and good looking” was used in the Australia sighting above. The original sighting in Alaska makes no reference to “young and good looking”. That means that Giantsfan22 are messing with us. A person describing BJ and Tyler would not refer to their shoes nor their clothing – but most likely to their facial hair – their most distinctive feature (assuming they are dressed in ordinary clothes). We may have to accept the fact that BJ and Tyler is not in the top 4 after all. how did everything go with the docu? Well we will find out soon. Because if this is true Bj and Tyler get eliminated next. But then we have Giants fan relative whatever saying the team with matching grey sweaters and blue adida's shoes in Alaska are The Hippies ,then theres that myspace entry @ Tylers my space from the girl in Perth about the airplane. First Turt says he/she saw 4 teams running past towards the prison. Later he/she says that he/she only saw 3 teams and that one of the teams came through in the morning and he/she had to ask another person who this 4th team was. How many teams did he/she actually see ? Why the discrepancy? It sound more and more like a fake spoiler to me - a little bit to convenient. So all three 3 teams would go to the same person in the same shoe store to ask for directions? What are the chances of that? I've gotta say, that March 13 myspace comment on BJ's site by Christiane, the Australian beauty contestant, to me is the most interesting thing I've seen. This was posted by a real person with a name and from the other posts, you can confirm who she is. Also....the Miss Teen Australia pageant was held in Darwin from November 24 - 27. And the young lady on the plane was from Perth. Could she have met BJ on a flight from Perth to Darwin? Does this fit with the speculated timeline? To me, unless Ms. Christiane has her racers confused, it looks like the hippies are still in it in Australia. That would make me happy. And yes, this is my first post. What did the Australian beauty say? Welcome teeliner :yaya: , i did not know about the pageant on the 24th to 27th !!! Nice find !! also aren't the Racers suppose to tell people they are making a document ? I think thats what Ucheena did . here you go mcalpine ( her comment to Tyler was bumped off but this is what I copied , with a link to her myspace site ) also aren't the Racers suppose to tell people they are making a document ? I think thats what Ucheena did . puddin, do you know if anyone saw the girl's comment on Tyler's site? It's still on BJ's but there's nothing on Tyler's and there are other comments from that same date. It seems that Tyler has been pretty good about editing things off of his site. He got rid of the E&J party pics pretty quickly that someone posted but BJ still has them on his. Thanks for the information on the Aussie dates. Whoa, that does look like a possibility, doesn't it? Personally, I would take this myspace comment more seriously than sightings by a U/I person posting on a board. I'm still hoping she got her racers ID'd right and didn't confuse them with someone else. Pleeeease. :bny7: Hey puddin, it's called the Eagle Express. Here is a picture of a Rottnest Island Ferry, Australia. Boingo WAY TO GO ! my 2cents , I've been saving this ,I never ever put the two together ! !